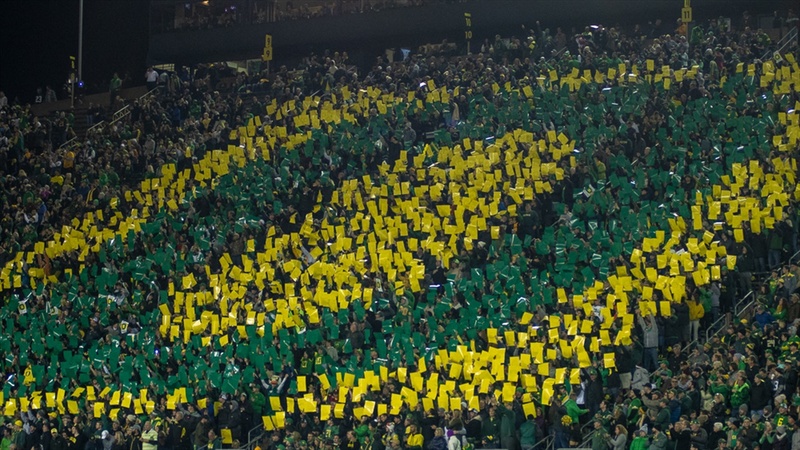 On Saturday, April 20 the Ducks will take the football field in Autzen stadium. The opponent, the Oregon Ducks. Your first glimpse into what the Ducks could look like this Fall happens in 3 short weeks. If you’ve noticed lately, the staff and Oregon football are making a huge push on social media for the game. It is a very valuable recruiting tool for Oregon and they only have one shot at it. Not only will they have a chance to evaluate the team, they will host more than 40 prospects on campus showing them fan support and the electric Autzen atmosphere. If you’re on the fence about going, here are five reasons why you should go. Don’t get me wrong. I love the state of Oregon. And there are a lot of great ways to spend a Saturday. On a hike, at the coast, in your garden or watching your kids play sports. All great things to do on a Saturday. But a nice Spring day in Autzen with the family is powerful. The opportunity to watch your favorite team and get an early glimpse is unmatched. There’s only one Saturday you can enjoy it, so don’t let it pass you by. Look, the world is expensive. I have 5 kids, so I know the value of a buck. Now the school does prefer canned donations for your entrance fee, so I guess it’s not totally “FREE” but in my eyes, you can’t go wrong having a good time, outside with the family on a few canned donations. Save the date, make the kids put their phones away and take them to the game. I mean, any chance to watch Justin Herbert is a real treat. But this will be the last time. So if you don’t plan on spending your hard-earned cash to see a game this Fall, spend none for the Spring game and see how Herbert’s game has progressed. He might only play a half of football, but it’s still a half of football. Duh right? But one of the best parts is seeing the new faces on the team. I also think an under-rated element is seeing the difference in the players. How the 4th quarter program has taken shape of their bodies and made a group of animals ready to take over the Pac. You can only appreciate it if you see them in person with your own two eyes.